Complete the look of your bedroom suite with the natural beauty of solid hardwood in our Elliot Ridge Dowel Bed. 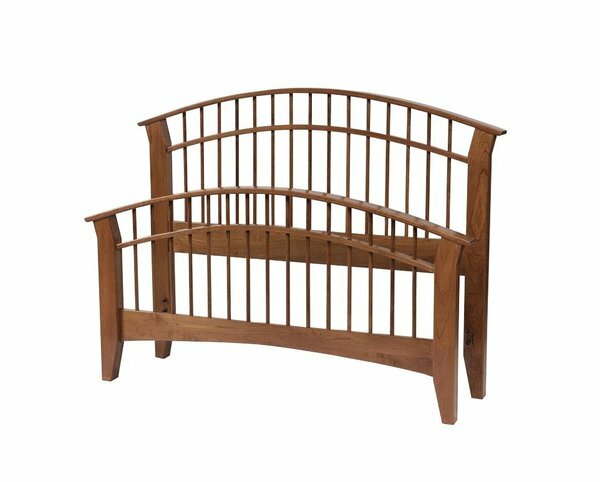 The classically inspired design offers a gently curved head and foot board that is supported by thick, solid wood legs, beautiful turned dowels, and a solid leg support that will ensure a lifetime of structural stability that can be handed down for generations to come. Each bed is made to order, so you select the size, hardwood, and finish options to get the perfect bed for your space. Each one comes complete with a head board, foot board, and two solid wood side rails that connect the mattress support slats below. Add the optional drawer units under the bed for a convenient way to store spare clothes, linens, or bedside essentials for easy access when you need them. The drawer unit is crafted from the same beautiful hardwood and will serve as your side rail and mattress support system. Please call one of our experienced furniture specialists today with any questions you may have on our Elliot Ridge Dowel Bed. We have stain samples available, so you can be sure your new bed can be incorporated perfectly with the rest of your bedroom suite. Slat Dimensions - 3" x 3/4"